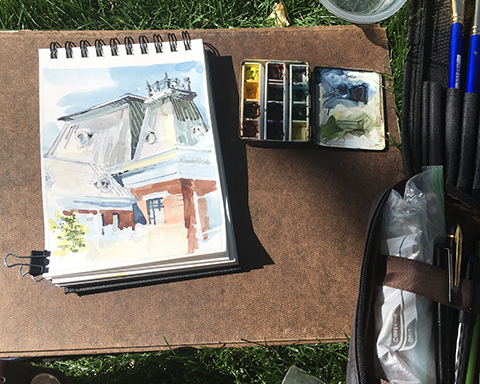 More news about Art on the road | Sketching … Always! 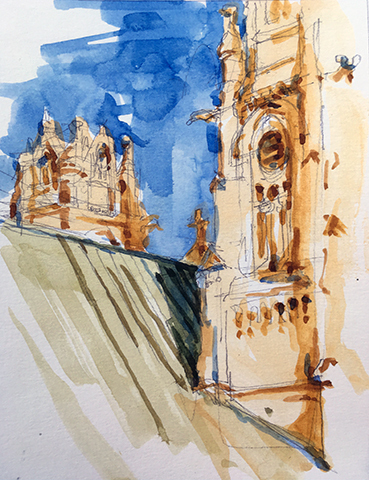 As I have said many times … sketch, draw, or paint … I will go almost anywhere. And for the past two months, I have been making images away from home and my studio. First it was just in places around Virginia; then it was out in Utah or when I was in transit. Summers have been the time of year that I most often travel and now that I organized my life around being a full-time artist … I still end up doing most of my major trips away from home during the summer months. For the past few years, when early June comes around, I get to judge art for a week. This year it was in Salt Lake City. That meant flying to Utah! 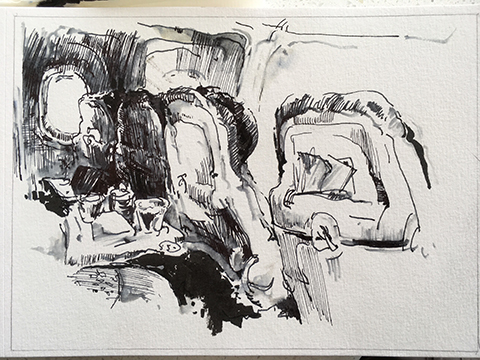 I keep any work I do while in a plane, train or other vehicle pretty simple; usually only working with ink. I pull out a fountain pen (or maybe two), possibly a trusty fountain brush pen, and maybe a relatively new tool for me … a water-brush. On this latest trip, it was just my favorite Waterman and the brush pen for this first image. 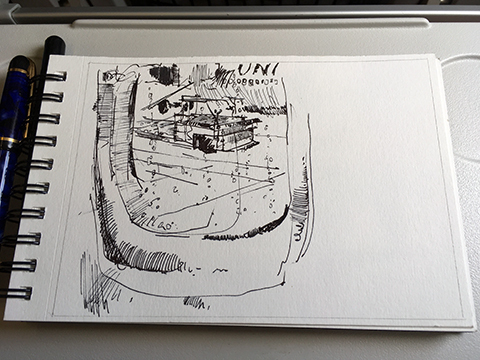 The view out a drizzle spattered airplane window began pretty traditionally, at least for me, with hatching and simple line work. Once I get warmed up, by using both permanent and water soluble inks, I can get a broad range of effects … from pen line, to brush drawing, dry brush, and even ink washes. Since it began a few years back, this gig of judging art for a week has been extremely enjoyable. Judging art for shows or reviewing art portfolios is hard work but also a real joy. Well, for the past few summers, I have been part of a team of artists and art educators who evaluate portfolios of students wanting to get AP credit for studio art as they enter college. We look at art all day for a week; some of it completely amazing and wonderful. But, by the time our ETS day winds down, I want to be making images myself! 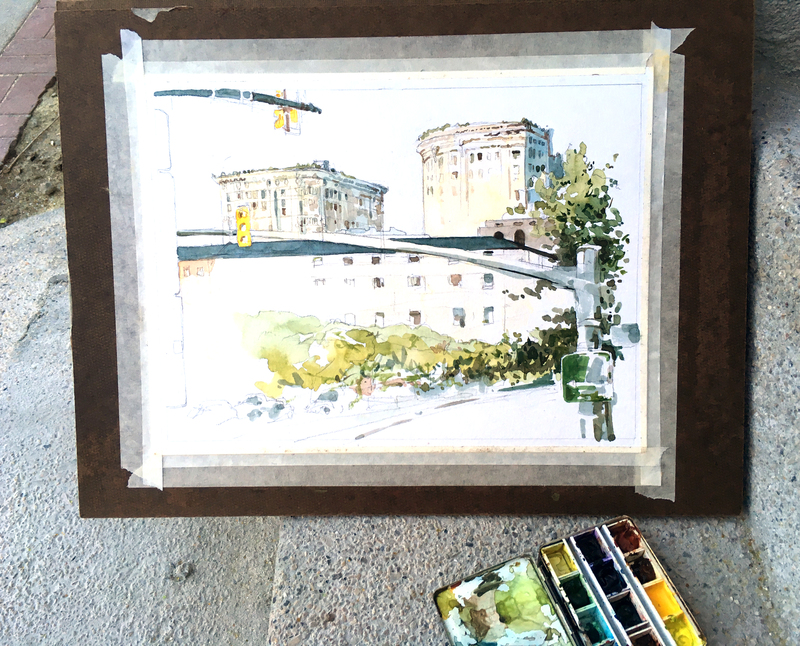 So, after a second day of working, at just after 5pm, a fellow artist-educator and I walked a few blocks, down to Main Street and took up positions to record the still busy city around us. Starting with pencil and then watercolor leads and ink, I do some small sketches. By the time I decided what to do, I had concluded that I wanted to continue working mostly in ink. 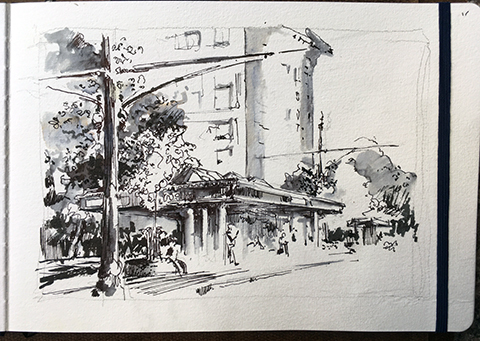 Main Street Evening sketches, SLC. 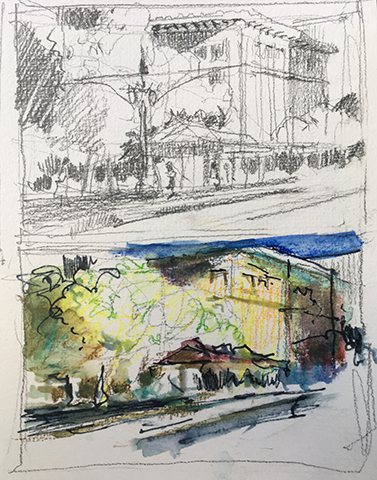 Being in Salt Lake for a week during some of the longest days of the year affords someone who wants to sketch after work lots of daylight for work. Several evening I went out with fellow sketchers and we explored various parts of the city but one evening I went out alone. I got just beyond the central core of the city and made my way over to the Cathedral of the Madeleine. I explored the building inside and out and found myself wanting to be able see and sketch or paint it in morning and mid-day light. Alas, my work for ETS keeps me busy from 9-5. Thankfully, the early evening light was intense; the creamy tan of the stone glowed a rich golden hue and the towers cast dark shadows across the aged green patina of the metal roof. On the last full day in SLC, we wrapped up early … so I headed westward through the city in search of more images. Being extremely wary of the high altitude clear sky sun, I applied lots of strong sunscreen and stuck to the shadows. The first place I stopped was at the old Pacific Union railway station. 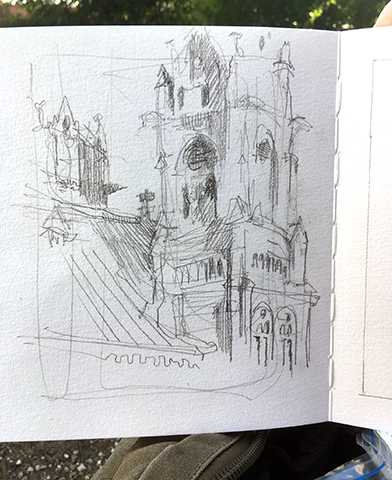 It is a huge and gloriously complex building but I only did a small sketch of part of the roof. After a light dinner, I turned back east and hoped to locate an interesting image of the city skyline framing or being framed by the tall peaks of the Wasatch Range just a few miles further east of the downtown. Instead, I became intrigued by a vista of many elements of the cityscape and especially a pair of nicely matched buildings that seem to sit across the street from each other. These two structures share ornate (Beaux Arts style?) decorative motifs. What really attracted my attention to them was the early evening light on their massive cornices and curved corner facades. I drew them and redrew them; correcting and adjusting my composition over and over again. I wanted to capture not just the two buildings (as lovely as they are) but something of the cityscape that framed them as well. The other rectilinear building elements, the contrasting organic shapes and the harmony of the multiple curves in all the signage, traffic lights, and suspended poles were quite exciting to me. I actually worked so long addressing the design and drawing issues, that I couldn’t finish laying in all of my color before the day’s light faded away. Even if it wasn’t getting dark, I also realized that I didn’t have any warm blues in my palette and none in my back up bag of pigments either. (How did that happen?!) I know that I could just leave it as it is; frankly I do the image like it this way. But I just think that I need to add a few more passages of color now thatI home! Yes, we all know, that isn’t really a kosher strategy with many of my urban sketcher friends or our true-believer plein-air colleagues. I wanted to finish this piece. So, I promised myself that I would be vary careful … and very restrained; I would rather the painting to be understated, even unfinished, rather than it being over done. This entry was posted in Art & Life by johnahancock. Bookmark the permalink.